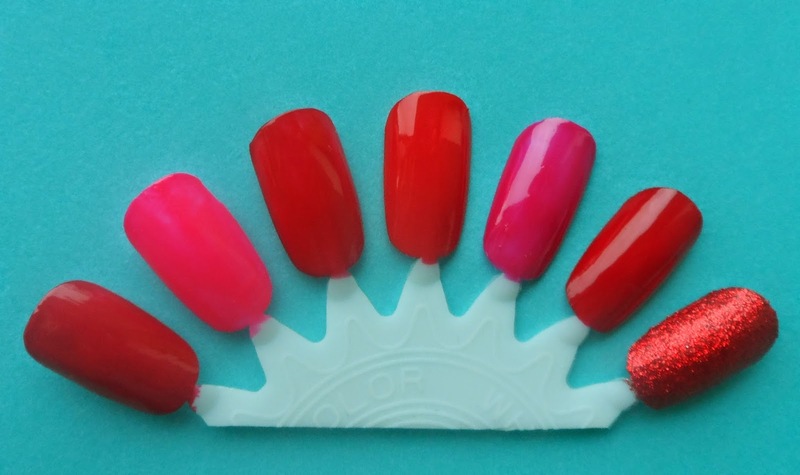 I love having fun nails, and I try to co-ordinate them to seasons and holidays – anybody else missing looking down and seeing Christmas trees and puddings?! As V-Day approaches (and I know many of you aren’t fans, so I won’t bang on!) I thought I’d do a basic selection of some of my favourite colours for this time of year. No patterns, nothing fancy – though if anybody is interested I can share some proper Valentine’s art, let me know! 1. Oriflame Pure Colour Floral Nail Polish. Two coats. 2. ‘Naughty’ from an old gift set. Two coats. 3. Red from a Primark make-up set. Two coats. 4. No.7 – Coral Kiss 39. Two coats. 5. Pink from the same Primark make-up set. Two coats. 6. Barry M Gelly – Blood Orange. One coat. 7. Barry M – Red Glitter. Three coats.